BONUS 100 pack coffee pods. Please note: Complimentary pods may arrive separately. KitchenAid have teamed up with iconic coffee brand Nespresso to bring you an ultra-stylish machine that brings artisan coffee into your home. Coffee lovers, rejoice! Not only can you enjoy barista-quality coffee in the comfort of your own home, you can also inject some colour and style into your kitchen with the KitchenAid KES0504 Nespresso. The trademark KitchenAid luxury is stamped all over this stunning machine, with a premium metal body and elegant curves which wouldn’t look out of place in the most opulent show homes. 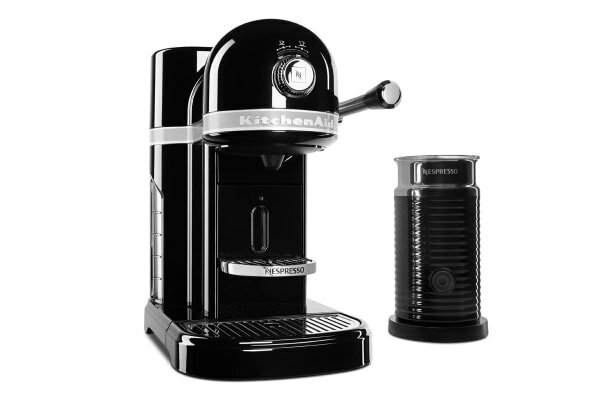 Far from just a pretty face, the KitchenAid KES0504 Nespresso also delivers on quality. With 6 pre programmed volume settings, you can choose the perfect strength for your Nespresso coffee, and adjust the cup tray to fit whatever sized vessel you prefer. And if long blacks just aren’t your thing, the included Aeroccino3 Milk Frother produces perfectly frothed milk, either hot or cold, at the simple touch of a button. Six of these settings control coffee strength and volume from ristretto to lungo (25-40-60-90-110-130mL). Magnetic Drive Blender Recipe Book. Looks great, performs even better!! !